Dealing in Early Teddy Bears and Soft Toys. 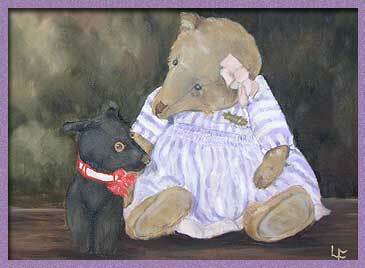 The Old Bear Company is delighted to offer you an extensive range of antique teddy bears and soft toys. With 27 years experience in the trade, we pride ourselves in providing a caring service to help you find that special old friend. It is many years since our beloved hobby turned into a full-time business, and this website was established in 1998 - the very first of its kind - dedicated exclusively to vintage teddies and related items. We specialise in Steiff bears and animals as well as Bing, Chad Valley, Chiltern, Merrythought and many more. From fine condition old bears to well-loved little characters, we are sure you will find something to fit snugly into your own collection. Please note these are collectors items and not suitable for young children. Updated constantly with lots of fun new pics each week, if you are interested in old bears, bookmark it and check back often! We ship constantly world-wide! Enjoy your visit and thank you for stopping by.